In all candor, this makes such a pretty piece, you can actually use it year-round and people will comment on it. When my mom first saw mine, she actually stopped to admire! So, however you use this easy decoration, it’s sure to be a hit. I used two clear milk jug vases. In reality, you can use just about any see-through glass container you’d like. In fact, the container doesn’t even have to be clear. Blue-tinted mason jars are beautiful and add a more rustic look. 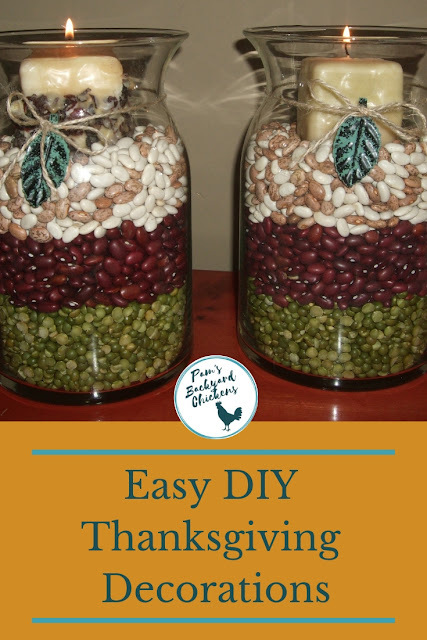 Once you’ve picked out a container, or two, simply fill it with layers of dried food such as split peas, red beans, corn kernels, black beans or pinto beans to name a few. Really it’s whatever you like or want to coordinate with your other decorations. Put a beautiful candle, again your choice, on top of your layers of dried food. (For safety’s sake, it would be great to use battery operated flameless candles.) Then tie a twine bow around the outside of the glass to complete the look. I added a metal leaf on each of my bows for a little extra fun. There are so many ways to personalize this easy craft and tons of ways to use it for Thanksgiving and beyond. So let your imagination run wild and enjoy!